Up today is another 7" sent to me to be reviewed by Punk Fox records. This time they've tapped the city of Salamanca and released three songs by Yawners. As long time readers of this website know, Punk Fox has not been a label that I have enjoyed consistently, however they have a winner on their hands this time with Yawners. 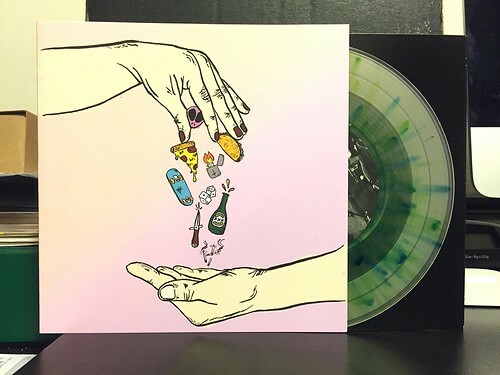 Female fronted, high energy pop songs are what you're going to find on this 7". This is a band that picks out their three chords, lets the drummer loose and cranks out catchy songs with nice loud, crunchy guitars. They remind me a bit of Baby Shakes, but with less harmonies and a meaner sounding guitar tone. Although Yawners are not reinventing the wheel, these are three pretty fun songs. Worth checking out if you wish Cub used a bit more distortion on their songs.